One of the reasons I like Lucha Libre so much is because of the really cool costumes and masks. Case in point, Super Fly. Super Fly was born on February 24th, 1987 in Puebla, Puebla, Mexico, and is the son of luchador El Seminarista. His uncles are all luchadors, Murciélago I, Murciélago II, Murciélago III and Robinson. 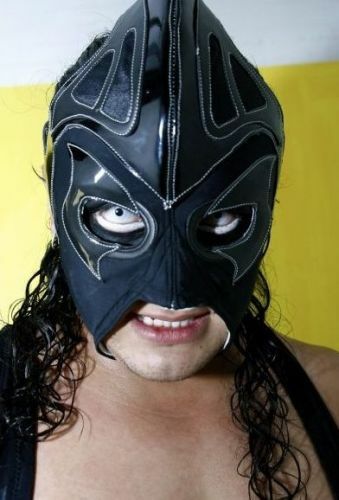 He was trained by his father, Skayde and Psicosis, and made his lucha libre debut on May 1st, 2001. Yes, he was just fourteen years old. After wrestling for smaller promotions, Super Fly signed with Asistencia Asesoría y Administración (AAA) in 2005. Along with Laredo Kid and Nemesis, he was one of the founding members of Real Fuerza Aérea (Royal Air Force), a group that consisted of young tecnicos (faces) that were high fliers. After enjoying several years as a hero, Super Fly turned bad and changed not only his tactics, but his ring attire as well. He left Real Fuerza Aérea and joined two other rudo (heel) groups La Milicia (The Militia) and La Sociedad (The Society, a merger of La Legión Extranjera, Los Perros del Mal, La Milicia and Los Maniacos).